Yes, it’s beginning to get a little colder outside and you may not even be thinking about an outdoor hammock, but I say it’s always a good time to look for a good time! So, let’s get to it! I received the Double Camping Hammock with Tree Straps from Live Infinitely ($36.99) and put it up in about 20 minutes. Here in the Northeast there’s till a bit a nice weather left before winter hits and it was such a gorgeous day that I was anxious to get outside before I’m stuck in the house for months on end. This hammock is versatile and can be brought camping. It also can go in the washer!!!! 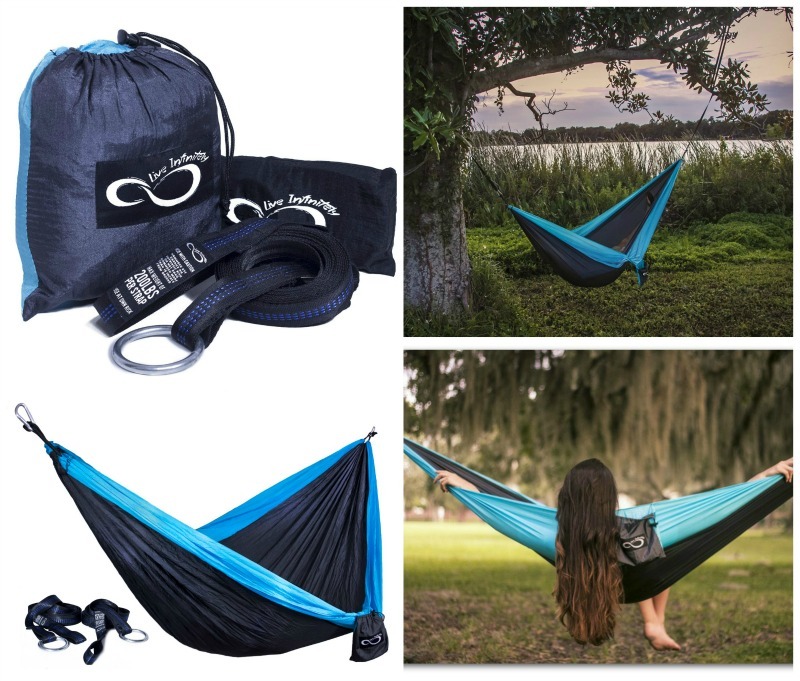 I love this feature of the Double Camping Hammock with Tree Straps from Live Infinitely! The hammock is also available in purple. Strong & Durable - Made from the highest quality weather resistant 210T nylon with interlocked triple stitched seams, guaranteed to hold 450 lbs. All Inclusive - 11' 5"durable weather resistant nylon tree straps that incorporate a stainless steel lashing ring and unique triple running stitch are designed to prevent stretching while still allowing simple setup are included with every hammock purchase. Versatile - The double camping hammocks measure 9' 10" long by 6' 6" wide (300cm x 200cm). When it's not in use it conveniently folds into the included gear pouch measuring 6"x 8" and only weighs 18 ounces which makes it the perfect portable hiking or backpacking hammock. Easy Clean Up - Patented colorfast nylon ensures that there is no fading or bleeding when you toss it into the machine washer after your adventure. Hammock easily folds into the attached gear pouch while tree straps roll up into an included nylon carrying case. You can get your own Double Camping Hammock with Tree Straps from Live Infinitely on Amazon!